After my trip with Don last year, I gained a new appreciation for BMW motorcycles. Don's bike was flawless on the trip and he seems really happy with it. Beth and I decided to get a new bike that would be comfortable for both of us on longer trips. I was fine on the Harley, but the passenger accommodations left a bit to be desired. I had ridden Don's R1200RT a few times and thought it would be a nice compliment to the Harley. 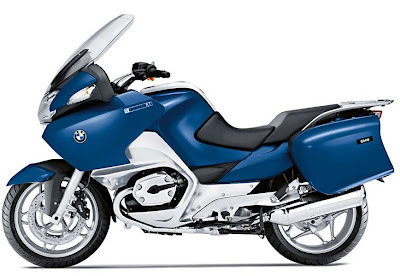 I sold the Ducati since I hardly ever rode it, and found a great deal on a gently used BMW R1200RT. Eric while we were in town. Here is a studio shot of the Beemer. My pics will follow soon!